Looking to bring a new choice in the sneaker market this Holiday Season, Jordan Brand will try to make waves as they are set to release a much-improved edition of the Air Jordan 1 Phat Low before the year ends. 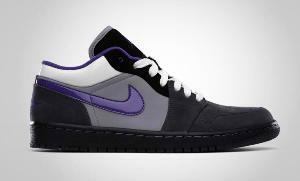 The Anthracite/Varsity Purple-Stealth-White version of the Air Jordan 1 Phat Low features a black upper part with a lighter gray shade at the center with a varsity purple Nike Logo just like the original Air Jordan 1 shoes. Although it’s almost the same with the original Air Jordan 1, the Air Jordan1 Phat Low brought a new dimension for the sneaker lovers, especially those who are engaged in skating. Its design is also expected to attract Jordan-shoes lovers that are looking for a shoe that fits their lifestyle. Watch out for its release this Holiday Season!